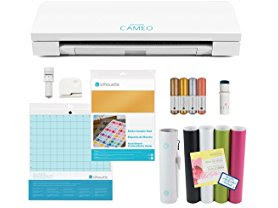 Hurry over to Woot.com because today only this Silhouette CAMEO 3 Craft Bundle is only $183.99 (Reg. $329.99)! Blade and other storage compartments keep all the extra blades and tools in one easy to access storage compartment. Bundle includes: CAMEO 3 cutting machine, Silhouette Studio software, power cable and USB cable, one 12-inch cutting mats, autoblade cutting blade, premium cutting blade, metallic sketch pens (4 pens total), sticker sampler pack, and vinyl starter pack.